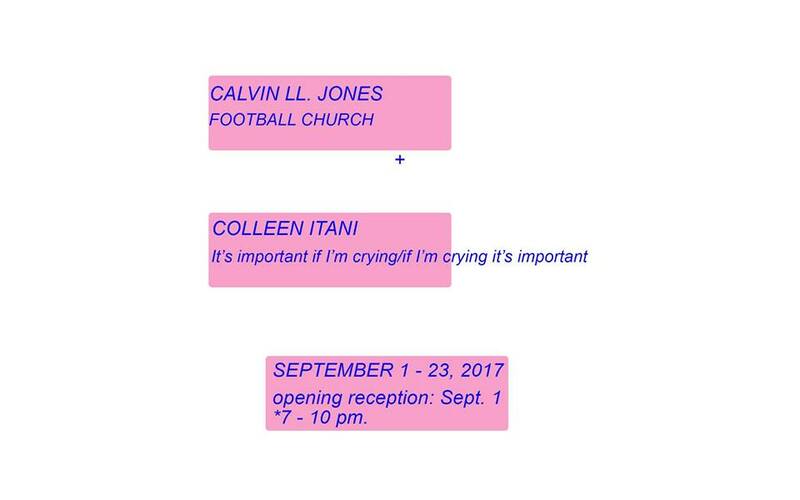 SOUP experimental is proud to present two exhibitions featuring FSU Art MFA ’19 Colleen Itani and FSU Theater BFA ’05 Calvin LL. Jones. Itani’s exhibition, “It’s important if I’m crying/if I’m crying it’s important” will show in the Mid-Gallery. I keep trying not to write everything down. I’m not succeeding yet. It’s important if i’m crying/if I’m crying it’s important examines the everyday. Fragments of thoughts and incomplete sentences give way to exposed joys and amusements of the banal. Obsessive thoughts become the content of the work and an inability to be satiated continues as I seek to comprehend personal moments. I am considering how buoyancy is good for emotions and how we prioritize our feelings. Play reignites the work and fluctuating ups and downs are captured. I let humor coexist alongside anxieties and bursts of energy. Meanwhile, Calvin LL. Jones’ “Football Church” (created with the assistance of James Gramling) will show in the Main Gallery. To illuminate the rituals of college football: Church of fraternal sacrifice and Cult of glory. The stadium is the new church of a modern-day gladiator, in which a student’s body and mind are sacrificed for the glory of educational institutions and the approval of the masses. Football players are infused with delusions of grandeur, and violence is pardoned within the context of winning. Sound engineer, noise artist & painter, Calvin is a recipient of a BFA degree from Florida State University School of Theatre in technical theater design. He is the sound designer for the San Francisco Ethnic Dance Festival and an international touring set and sound designer for the Kronos Quartet.